Dame Edna Everage is a character played by Australian comedian Barry Humphries. As Dame Edna, Humphries has written several books and hosted various television shows (on which Humphries has also appeared as himself). In 1979 Dame Edna was the subject of a BBC Arena mockumentary: La Dame aux Gladiolas. 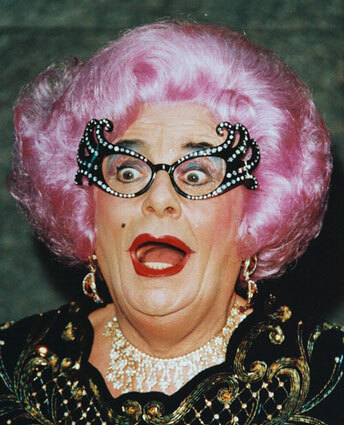 Although Humphries freely states that Dame Edna is a character he plays, Dame Edna consistently denies being a fictional character or drag performer, and refers to Humphries as her "entrepreneur" or manager. Indeed, Dame Edna has frequently said that the thought of a man dressing up as a woman for entertainment purposes is repulsive.